The platforms at Crouch End looking north. Top level photo taken by Peter Wright in 1970 (©2003), the bottom level photo (move your cursor over the above image to view it) taken around 1979.
demolished along with the old bridge. Click here for Peter Wright's excellent site of the line as it was in 1970. 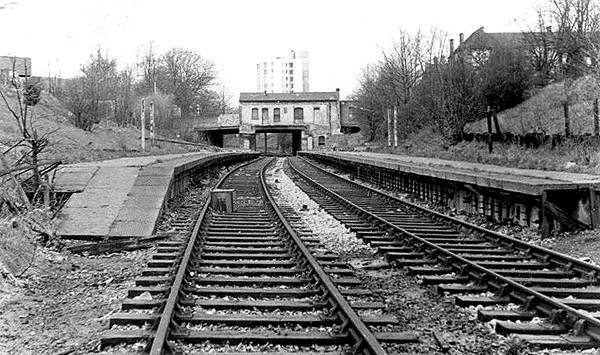 The platforms at Crouch End looking south from where the station building used to be. At the northern end of Crouch End's southbound platform are the bricked up remains of the base of the old station building. Closer, more recent view of the bricked up windows of the lower level of the station building. The station building for Crouch End stood on this bridge over the line where the strange upright brick mini-towers are. The two premises to the left of it have survived from operational days - the rear of them can be seen in the photo two above this one. The location of this station is about a third of a mile from Crouch End Broadway, the hub of Crouch End. The hill between the two is quite steep as well. The ideal position for a station serving Crouch End would be the green area in front of the town hall. The author, indulging in a fantasy money-is-no-object mode, would like to see the line dive into a new tunnel immediately north of Stroud Green station, serve Crouch End Broadway, then head back toward the surface, rejoining the original alignment before it reached Highgate. This sign was situated just to the left of the two buildings in the photo above. It went 'missing' sometime in the 1980s. The bridge over Stanhope Road - the line nestling in the valley between Shepherd's Hill and Hornsey Lane. 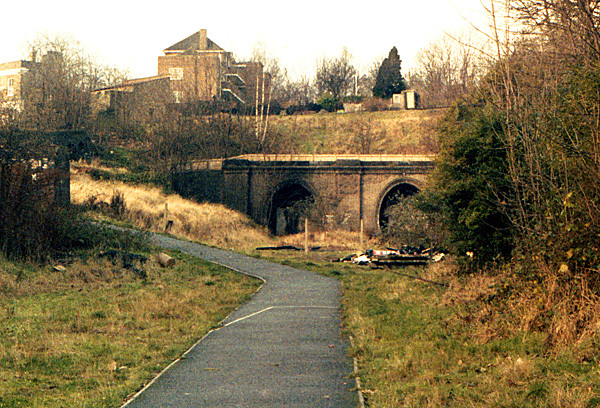 The bridge was demolished (presumably due to deterioration) and replaced by a one-track width footpath. Very narrow bridge (for cars) over Northwood Road. Looking north at the southern portal of the southern tunnels, in the late 1970s or so. The forestation of the line is indicated by the 2009 photo taken from approximately the same position. Move your cursor over the image to view it. The tunnel mouths south of Highgate station. These have been used for filming episodes of Eastenders and Waking The Dead amongst others. Screenshot of the BBC drama Waking The Dead - Trevor Eve with his back to the camera. This was filmed circa Mar 2003. Waking The Dead (the episode was entitled Thin Air). Southern end of the northbound tunnel. Open for many years, these gates here were welded shut in 2009. Looking south from Highgate station at the southbound tunnel.